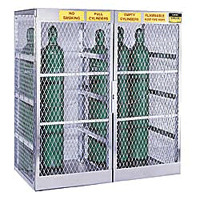 Aluminum Cylinder Lockers Designed for outdoor storage of cylinders and LPG containers. Heavy-gauge mesh and extruded frames are constructed of heavy .081 non-sparking aluminum that is 58% thicker than other models. Sloped roof allows water and ice to run off and the entire locker will not rust, discolor, or corrode. Pre-drilled corners accept 1/2" anchor bolts. Includes padlock lug and information labels. Meets OSHA 1910.110 and NFPA 58 standards. Ships assembled. FOB ILLINOIS.